As your captain Brad Smyth, I truly believe I was born to be a sportsman. Growing up in Sterling Heights, Michigan I spent most of my weekends fishing, hunting and enjoying the outdoors. Whether I’m in the woods or on the water, my motivation is to teach others what I’ve learned along the way and share my passion for the outdoors. If you’re someone who has never fished for walleye in the Detroit River, you’re missing out on a fishing experience like none other. In the spring, shortly after the ice begins to melt, up to 2.4 million walleyes start making their journey through the Detroit River. 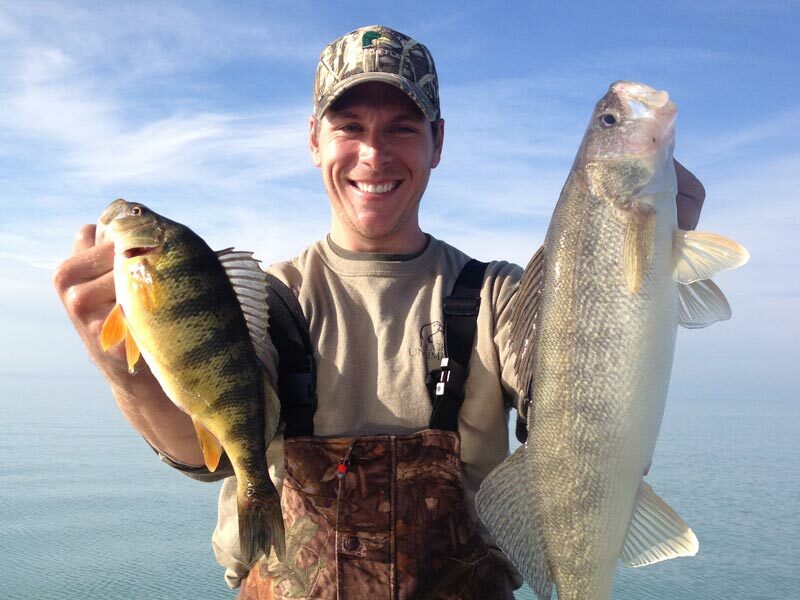 Walleyes are abundant on the Detroit River right through until the water starts to freeze again, but the best walleye fishing is between April and the end of May. This is because during April and May, there are about 75,000 walleyes in every square mile of the 32 mile river. Later in early June the walleye taper off a bit and are joined by so many white bass that it becomes a little harder to catch just the walleye. Just because you have a fishing boat and a jig to drop, doesn’t mean you can make them bite though. There are some special techniques Detroit Outdoor Adventures can share with you so you’ll know how to make them take the bait. Vertical jigging is one of the techniques we use at Detroit Outdoor Adventures, where the boat is stationary or moving very slowly, because you must move slowly to stay vertical. When you charter a fishing adventure with Detroit Outdoor Adventures, we will provide all the equipment you need, but you must provide your Michigan or Canadian fishing license. We’ll take you out on the Detroit River on our 21′ Crestliner Nordic which offers a full walk around center console design which is not found on most fishing boats. The full walk around ensures maximum usable fishing space for our guests. The all welded Deep V Hull makes cutting though waves a breeze and delivers an extremely smooth ride. The side gunnels are the deepest in the industry, which provide comfort, safety and stability in rough water. Our Crestliner also features the latest technology in electronics, rods, reels and tackle. Top of the line equipment combined with the superior design layout of our Crestliner, guarantees a comfortable and successful day chasing walleye on the Detroit River. After your day of fishing for walleye on the Detroit River, Captain Brad filets them at Sinbad’s Marina then takes them inside for cook to order! It’s an experience you’ll never forget. To book an outing or for more information please fill out the form in the sidebar, on the contact page, or call 586.945.7429, today!